In a proper back swing, the shoulders rotate around the spine, instead of the lead shoulder. A common problem that many golfers suffer from when playing is that their lead shoulder is ducking, or dropping down. This is caused by a failure to properly turn about the axis as the golfer is swinging. 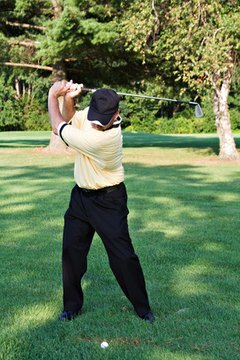 To compensate, the player drops his shoulder, which allows the backswing to get farther back, making the player feel like they are swinging back properly. Understanding the difference between rotating the shoulders and ducking the shoulders is essential in correcting a shoulder ducking problem. Players can become confused as, even when properly rotated, a shoulder does not remain at the exact same height above the ground, and so some players have difficulty understanding the difference between a turn and a duck. When ducking the shoulder, the height of the shoulder is not changed slightly as a result of the natural turning, but is instead dropped straight down, while the lead shoulder is elevated up higher. The easiest way to identify the difference in a duck and a turn is by looking at the alignment of your chest. If the chest is still facing nearly square to the ball when the shoulder moves, you are ducking your shoulder, not rotating it. When you duck arm in order to make your backswing reach the desired length without putting in the required level of upper body rotation, the most drastic change to the swing will be the path of the club's arc. The arcing path of a golf club for most swings should be only slightly off the desired target line for the ball. When using a shoulder rotation for the swing, the club will still leave the target line, but not to any great extent. With a ducked back swing, the club will be brought back along a much flatter plane, and the head of the club will point drastically off of the target line, often pointing well behind you. Due to the poor path of the golf club, shots hit with a ducked-shoulder backswing will often be far more erratic than a proper swing. The most common malady that duck swingers have to deal with is a sharp hook of the ball. Hooks are so common when the shoulder is ducked that is called a "duck hook." While correcting the duck is not a sure-fire cure for hooks, as other problems can factor in, it will reduce the frequency and severity of hooking for most golfers.